You know the drill — this is the classic band fundraiser. Sell to your relatives, friends, neighbors and co-workers. 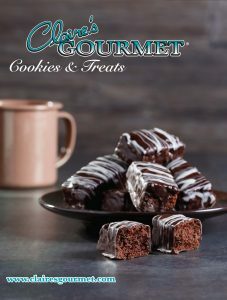 Claire's Gourmet offers a wide selection of high quality gourmet desserts, popcorn, pizza and other treats! Brochures and order forms were made available to the students to use for selling. If you don't have one, ask anyone in CFOM to get one. Also, you can go to Claire's Gourmetand click "Login" at the top of the page to set up your participant account. Use organization #5508. Give relatives and friends your six digit participant code to order online. Our goal is for every student to sell at least 10 items. You will receive $40 credited to your trip account for every 10 items sold. Sell 25 items and earn half off your trip deposit. Sell 50 items and your trip deposit is covered! Claire's Gourmet is offering a Mega Drawing prize — $200 trip credit! Earn one chance for every 10 items sold! As a Music Program, we must sell 400 items to receive the drawing prize as a gift from Claire's Gourmet.